This traditional, Florida-style island cottage was completed in 2001 and is situated less than 200 yards down a private path to the Gulf of Mexico. This home has only one elevated, single-level, floor plan providing ease of access and family-friendly living. It is designed to provide the utmost comfort while capturing the scenic beauty around it. Features include: Outdoor living environment includes a heated pool with wrap around wooden deck, covered outdoor bar, pool table, barbecue and eating area. The relaxing and stylish interior retreat has a spacious private master suite with study/sitting area and master bath, along with two additional bedrooms in a split floor plan, and a second large bath. Sleeps six with one king, one queen, and two twin beds. A convenient utility room with washer and dryer adjoins the kitchen. The village of Upper Captiva: The village of Upper Captiva sits on the northern tip of North Captiva Island, a secluded tropical island in Southwest Florida. This bridge-less island is unique among the sandy coastal barrier islands of Florida. North Captiva Island is surrounded by the warm waters of the Gulf of Mexico and Pine Island Sound, about six miles off the mainland of Florida. Boca Grande lies to the north and Captiva and Sanibel lie to the south. Bath adjacent to Pool with outdoor shower. Pat and Tom were so helpful. We met so many nice people and everyone was very accommodating. The island is a dream! No crowds, lots of wildlife, fun, and sun! Adrenalin Fishing Charter was the best! Love the outdoor pool and entertainment area. We are planning our next trip to North Captiva Island!!!!! The house was terrific. The pictures do not do the house justice. The pool and outside area were large and a great place for our family to hang out. Great family and hopefully we will see you again! Downstairs play area great for kids and upstairs lanai awesome for adults. The pool is heated a a pleasant addition to the house. We enjoyed out stay. Perfect spot, lovely, quiet, close to the beach. The property is so spectacular that I almost hesitate to discuss how great it is as I know I'm letting out the secret out of just how wonderful the location, condition, and amenities of this property. It's a short walk or short golf cart drive to any beach. The island is a dream.... If you want shopping malls and lots of restaurants, then this isn't for you. Back to the this great home, WOW!! It's an oasis of fun with a great area to enjoy the outdoors in the shade with a billiards area, outdoor bar, and hammocks everywhere that surround a very nice pool. What makes this property truly special is the care and love that Pat and Tom have invested into it and that is why this place is an A+ property. We WILL be back!! Thank you Pat and Tom and Lilly too! Very clean, large, with pool, covered deck, bar, pool table, kayaks, and every thing you need. Lot’s of amenities and a short (minutes) hop to any part of the Island. Plenty of comfortable beach chairs, kayaks (4), bicycles (12?) and two golf carts. All the best appliances. Caught a lot of fish off the beach while there. Shells always washing up on beach but most importantly, the beaches are beautiful and not crowded. 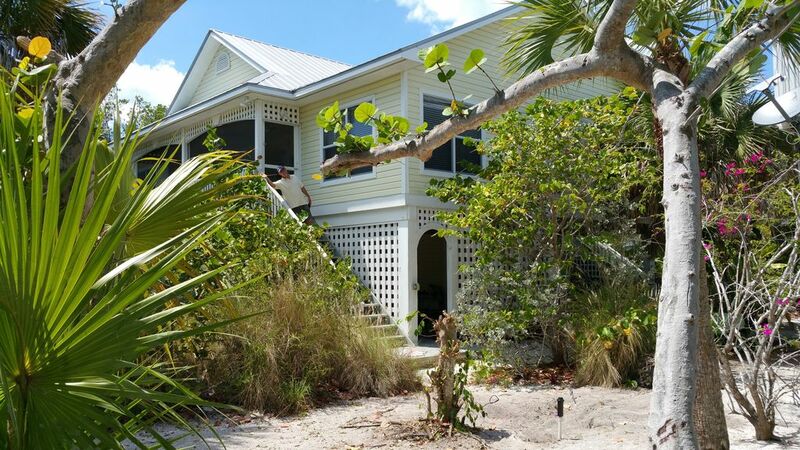 It is a short walk or quick ride in the golf cart to reach the pristine natural beach of North Captiva Island. We on Hidden Lane are in the popular “close to everything” neighborhood of Jose’s Hideaway. The house is part of the beach lying on one of the highest coastal “back dunes” about 200 steps from the windswept shore of the wide open “fore dune” environment. There are only four other homes scattered on the secondary dunes between you and the Gulf of Mexico. convenient. The golf cart and bicycles are provided at no extra cost for exploring the island. A variety of beach accessories include beach chairs, beach towels, skim boards, kayaks and much more. Transportation to the Island is available by water taxi/ferry by fare. Boat rentals and fishing charters are also available nearby.